It is 5 in the morning and everybody is up. The only day when no one minds waking up early and are rather eager for the dawn to crack, for the journey to begin. Hastily, while brushing our teeth we go through last night’s packing to check if we had not missed anything; specially snacks and gifts for our loved ones back home. Bumping into each other sleepy eyed, we all get ready and pack ourselves some homemade “lawaar, chutney, potato audang and curd” for the road ahead. After years I am heading to Lahaul. I am curious and my heart full of mixed feelings. We crossed Nehru-Kund and I looked at the mountains gaining height with the same awe and wonder as I had for the first time, I was back again a little girl. Today I am a tourist in my own land. Over the years the distance has only increased and the relationship has become complicated. As we mix with the world, try to blend in with myriad shades of cultures, ethnicities and people; gradually moving towards oneness of humanity. Why then I still try to find my own oneness here in this place? I know its not just me, I see many of us floating on the same boat seeking something from a land we are told we belong to, something that has been missing forever. May be I am seeking a closure? Or may be acceptance by the place! “Who are we? where did we come from? How did we make it here? How come we all are same yet so different? I don’t know how many times to how many people (known and strangers alike) have I asked these questions, the responses being no more than strange stares and condescending expressions to only a few giving me a persuasive answer. And then I moved farther away as life took its course but in my later years, while studying in Panjab University, I came across people from my land, the way I had never before. We worked together for revival of the Lahaul Spiti Students Association, the chandigarh chapter. While during the course we met, bonded, laughed, danced and spent time together, the same old questions began haunting me. We were all same yet so different! At around 10 a.m. we were a few meters before Rohang top. En-route to Lahaul, people get stuck in traffic jams so often so much that one would feel of a journey incomplete without it. While stuck in jam, we decided to use the opportunity and enjoy our homemade food in the car. The lawaar and the chutney added more fun to the journey however I wasn’t able to enjoy the moment wholly but reminisce the good times spent in Marhi. I could see it down below from my window, empty and barren it laid, holding in it a thousand memories of tourists and people from Lahaul-Spiti. I think of our parent’s generation who have even more memories than we do of this place, a connection that has been abruptly cut since the Himachal High Court’s order last year. It gave me an eerie sense of abandonment for the place. It is said healing comes faster and easier when you’ve had a chance to say goodbye. To be honest, not being with her (read Marhi) in her last moments will never give me the closure I seek. Every time I’ll cross this place, a desperation will run down my veins, an utter urgency to see the old Marhi back again, just to relive a few good minutes for one last time!- an essential part of my childhood memories will always linger here. All the same, the order brought some peace back in the mountains sans the new tourists spot just a few meters below Marhi, ironical it is. Finally, after an hour the traffic opened up and we continued journeying, gazing at the beauty around, observing the calm mountains absorbed in deep meditation with invincible peaks as mound of hair on top of their heads like that of Lord Shiva’s. 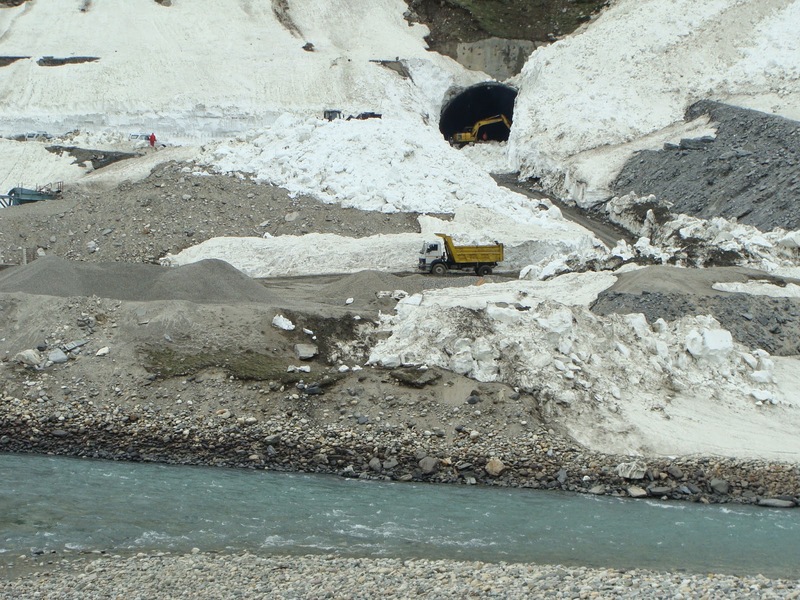 We started moving downwards on the meandering road and soon the first village of Lahaul ‘Gramphu’ was visible. Departing our ways from the road that led to Spiti; I looked back at it and smiled with a genuine empathy for those who tread this path to seek something either money couldn’t buy them or the cities deprive them of, perhaps serenity, an adventurous adrenaline rush or an escape from reality. The yearning to be unconfined and to know more than that meets the eye, often takes man to unknown places, while some claim to find paradise others merely a few antique travel gifts and memories. At about 1 pm we stopped at Khoksar for a warm cup of tea. I had never seen it this packed up before; quite obviously we had to move on since not a single seat was available. But I did manage to admire the small station for a few minutes- it seemed as if time was an alien concept here, the many decades old tiny mud shops, the wooden green-blue painted seatings, people in the shops-nothing seemed to have changed; I don’t know how long it’ll manage to stay unaffected by the so called virtues of the modern world, given the pace at which everything is changing. The next time I am here, there could be concrete cement shops flashing attractive exotic menus and I would miss old Khoksar dearly like I miss Marhi; to avoid the regret I rather just admire its charm now- I thought to myself. This may be why, I gave it a long hard look before it disappeared into the distance. However from far away, the crowd at Khoksar looked nothing less than a small gathering or a local fair. People living in the valley still carry an old world appeal- vintage enough to impress a modern man; particularly the woman here with head covered in colorful scarves, adorned with heavy tadka’s in their ears and red-turquoise precious gem necklaces, draped mostly in brown-black pure woolen (piyud) katar; ironically men moved on to wearing jeans and shirt-pants. I amuse myself imagining of Lahauli men walking the roads in cities in local attire- why should women alone carry the baggage of conveying forward the ‘apna culture hai’ syndrome? Anyway, I was more surprised and rather lit up by the fantastic condition of the road from Khoksar onwards. Later, we stopped for a moment to look at the north pole end of the (in)famous tunnel project. I stood there trying to make some sense out of what I was seeing- here you are amidst a fragile and a valuable treasure of nature, everything calm and pure, almost like a time machine when you are disturbed by roar of a snow-cutter’s engine clearing snow in front of the tunnel. How I wish the snow atop the tunnel all fell and covered the tunnel, frozen so much that they could never clear or cut it ever. I have nothing more to write on this but can only feel apologetic for the disasters mankind brings on itself, repeating the same mistake over and over again. We arrive at our destination at about 4 pm. After a warm welcome and a hot cup of tea, I decide to take a tour of the house, while others continue with their endless chatting. I am always primarily interested in visiting the kitchen and the store room. The peculiar smell it exudes, the rawness in it is a sharp memory I have been carrying with me since childhood. I remember following my naani to the store room through a secret like low roofed passage from within the gaps of walls of adjacent rooms, in hope for some treat. But the moment I would step into that room, I just stared at everything without a blink- the dried meat and bones dangling on the roof, the 5-6 feet tall food drums, the heavy wooden masala box and other wooden utensils, an electric curd maker, hunh!, a stone mortar and pestle smeared in and still oozing fragrance of tongue tickling green coriander chutney. The waft of the store room would stay with me for the longest time even after we had returned. At dinner we had a comforting bowl of tsati and then we plunged into deep sleep. It is always heart warming to be able to come and visit Lahaul and find it still in its pristine state though relatively. And before it converts into another seasonal tourist place, I would recommend to have your own peace- an acceptance with the place, perhaps a last goodbye so that in future there is no complaining and instead only respect and a sense of pride for what it used to be. After the brief stint of meeting my fellow people in later years of college, I read as many books on Lahaul-Spiti as I could grab my hands on and along with insights from the elderly in house, I was left even more amazed about the human civilization as in whole. Our own very story is a perspective in itself of journey of humankind to survival, to becoming this. All that longing, a search of identity and the mystery of we all being same yet so different came to a fine closure with this “Journey Back Home”. Word of caution (Pun intended): For a few who have not had the opportunity to travel to their native land quite often , it is highly suggested to avoid going out for a walk or stroll at night, the silence you experience there might cause devastating effect on your city-lifestyle driven brain functionality. Published in Lahaul Sptiti Students Association Chandigarh Magazine ‘Ningtam’ 2015 edition. Posted in Print, Published. Tagged Gramphu, Himachal Pradesh, Khoksar, Lahaul-Spiti, Manali, Marhi, Rohtang Tunnel. Previous: Previous post: Lemony Days!